In principle, just like the space of 4-digit base-10 numbers, there are 10,000 possible combinations. But in practice, there are far fewer. 1. How many English words can be made with this lock? The correct combination is a valid English dictionary word. The word is also a member of the small set of triple words for this lock, meaning that all 3 words appear on one configuration of the rings. 2. What is the correct combination for this lock? 3. How many twin words and triplet words are there? What about higher levels of word multiples? 4. 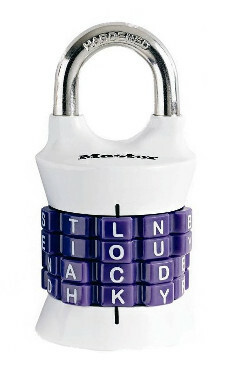 Change the letters of this lock (again with 4 rings with a set of 10 unique letters on each) to find the lock with the most multiple words of the highest order. How high can we go with English? Quadruplet words? Quintuplets? Sextuplets? Septuplets... octuplets? ?